Let me start out by saying the body does amazing things. I truly believe that had I not had issues Thursday late night early Friday morning with our noisy neighbors being up I would’ve gone into labor on Friday instead of Saturday. I told my husband Friday morning to be prepared because I felt labor would start between that day and Saturday. I called my midwife LeAnn Friday night and told her I had been having stronger contractions and wanted to give her a heads up, I believe my body knew just how exhausted it was because right around bedtime Friday night all contractions stopped and I got one of the best night’s sleep I had in a long time. It did help tremendously that my husband went out and warned the neighbors that we would not be having any issues with them being up late and being loud that night. Saturday July 25th 2015, 40 weeks plus 3 days gestation, I would wake up to some contractions between the hours of 8 and 9 am, these contractions were definitely stronger than I had been experiencing in weeks past, they weren’t lasting very long and I was having roughly 3 an hour. Once these contractions started I had to laugh at myself because for quite a while I wasn’t sure I’d recognize what labor would feel like. But once these started, I definitely had that “Ah ha” moment. I called my midwife LeAnn around 9:10am and informed her of the stronger contractions and she said she would start getting ready and would stop by to see how things were coming along, she also told me that if things picked up pace to definitely give her a call and she would head over sooner. I gave my birth doula Michele a heads up as well, told her to take her time because at this point they were still few and far between and not lasting long. By about 11:40am I called LeAnn again and told her that contractions were now 5 minutes apart and lasting roughly 30-40 seconds. I also contacted my birth doula again and told her she should probably plan on heading over. I hung out around the house, my husband had been in the kitchen making homemade hollandaise sauce, so I decided to eat some eggs benedict for lunch. I called the sitters for the other kiddos and had them on high alert for a possible pick up. Even at this point I’m still anticipating these contractions to stop. At 12:30pm I called LeAnn again and told her contractions were still 5 minutes apart but they were now lasting 60 seconds and were stronger. I was finally starting to think maybe, just maybe these bad boys were sticking around.LeAnn arrived at the house at about 1:15pm, and I greeted her ever so cheerfully at the front door.It may have caused LeAnn to wonder if this really was the real deal. Contractions were now every 2 minutes apart and lasting between 40-60 seconds. Not much longer after LeAnn arrived, Rebecca; LeAnn’s assistant, Michele; my Birth Doula, and Haley; another Birth Doula arrived on scene. This day was turning out to be a pretty hectic day as it was, it just happen to be the day my mother in-law was coming with a U-Haul trailer to get her furniture out of the house. So I also had my brother and sister in-law at the house along with my mother in-law for a short period of time. Once all the kids went to their designated sitters houses I was able to focus on the labor and what I needed to do to get through each and every contraction. I was having some right hip pain with these contractions, just like the hip pain I had experienced with my 3rd labor. My birth doula Michele had suggested doing some pelvic release upstairs in the bedroom. Before we did that, LeAnn wanted to check to see if I was making any progress and of course I had made progress………very little progress. I was only between 2-3 cm and still 50% and -1 stationed. But it was still progress. Michele did the pelvic release and I do have say, that is the most relaxed I had felt during the labor and I highly suggest any laboring women to have some pelvic release done during labor. After the pelvic release we did some sideways laps up and down the stairs to also help with the right hip pain. Once all of that was done, my birth doula Michele, my husband Delhon, our 12 year old daughter Makayla and I all went for a walk around 3:15pm. It was quite the warm day outside. I think the temp topped out in the high 80’s on this day. My midwife, her assistant Rebecca and Haley (Birth Doula) all went up to the Sandwich shop here in Preston to grab a bite to eat. On the walk our daughter Makayla was able to take some great pictures of us along the bike trail and back to the house. She captured some amazing moments that I will forever cherish. We were back to the house by 3:30pm where I used the birth ball with some hip squeezes with contractions every 2 minutes apart. When LeAnn got back to the house at 3:45pm she suggested going back outside for another short walk but I was feeling some nausea with the contractions so I decided to hang out inside for a bit longer and instead did laps around the dining room table. This was when I had my one and only emotional breakdown. I had lost my mom September 15th, 2014 of cancer. We moved her and my step dad into our house to help care for her. I laid in bed with her during her final hour of life and watched her take her last breath. Two months later we found out we were expecting. 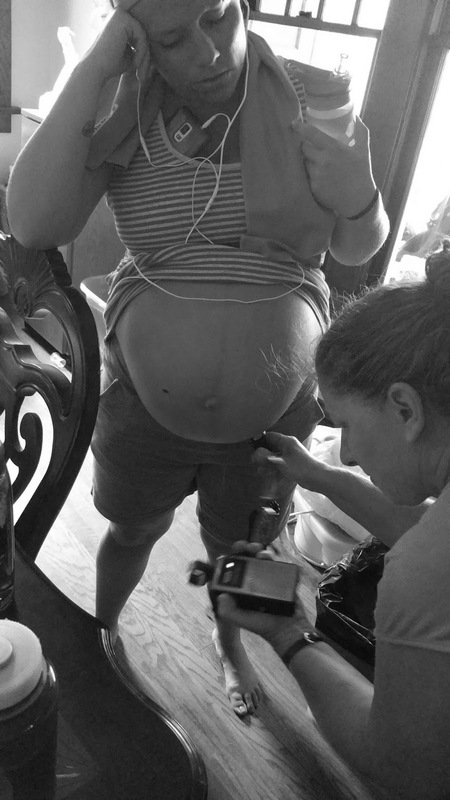 At this particular moment in labor, I had my headphones in listening to my song list I had put together weeks before. As I walked around the table and continued to have contractions, I had a pretty intense one and I just had this moment on overwhelming feelings. As that contraction lessoned in intensity I broke down and cried for a few minutes and continued to walk around the table. So heading into giving birth to the others I raised hell to the nurses and doctors ahead of time about the kidney shaped “puke bucket”. Are you kidding me? There’s no way all of my puke will fit in that tiny thing. So I demanded something bigger, this time around I had a nice giant bowl. By 6:30pm I suddenly felt the urge to push. LeAnn came over and wanted to check to make sure I wasn’t just 7cm. During this time it was very hard for my husband not to lose his cool with our midwife. As I’m having intense contractions my midwife is in the process of checking me at 6:32pm and kept her hand there to help with the anterior lip, all the while the assistants and my husband are trying to get the birth pool, which was completely full by the way, moved out of the way so we could lay a mattress down on the floor where I could give birth. Of course my screaming wasn’t helping matters any and it caused a great deal of concern for my husband who really was only seeing me in pain and wanted nothing more than for me to not be in pain. So, yes he about jumped over the couch and took out our midwife, but luckily he kept his cool and we later explained to him that she was trying to make sure the anterior lip was out of the way before I really started pushing. At 6:33pm I was complete and ready to move to the floor to push this baby out. 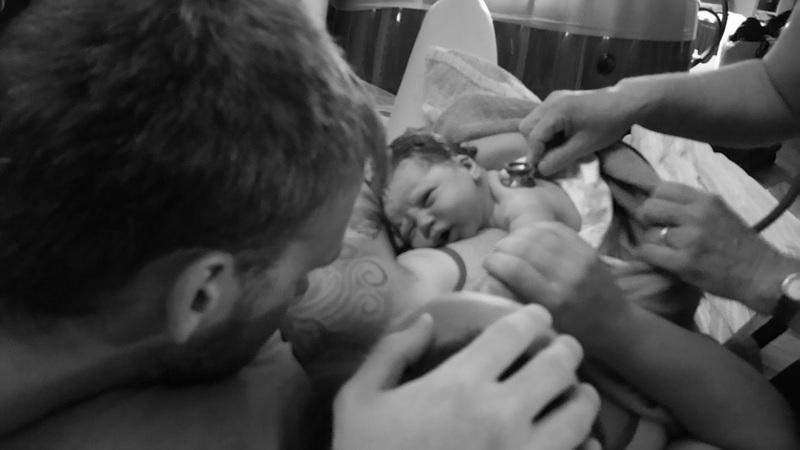 Choosing to have a homebirth was probably one of the best decisions my husband and I have ever made in life. Except for having children, they’re pretty great too. To be able to be in the comfort on our own home, not having to worry about packing things up and leave a hospital in a couple of days was amazing. Our house was clean and our laundry was done, we had nothing to worry about for a few days after the birth. We just sat and enjoyed our new baby. Having the great support team with us was also amazing and if I could have them here all the time I would. By 4:15pm I was starting to moan with contractions and at 4:30pm had asked if I was able to get into the birth tub. LeAnn said we would need to check my progress before letting me get in so we didn’t risk getting in too early and delaying labor. Unfortunately I was now 4-5cm, still 50% effaced and still roughly -1-0 stationed. It was still too early to get into the tub. My contractions had now become 5-7 minutes apart and lasting almost 60 seconds. Finally at 4:50pm I decided to buck up and go outside for another walk, this time I went with Haley, my husband and Makayla (12 yr old daughter). I only made it about ½ way down the block before deciding the contractions were just too strong to be walking for 15 minutes. We turned back around and came back inside. My husband says that it scared him when I kept telling him I didn’t feel well after contractions. Really, I was just feeling a little nauseated and that was it. At 5:15pm Michele and LeAnn suggested getting into the shower and letting warm water run over my belly. At this point I was up to try anything, especially since I wasn’t able to get into the birth tub. Not 5 minutes later I wanted out because I was suddenly hungry. I requested cheesy scrambled eggs and wanted to finish my 4 slices of toast I had requested earlier. While they were making that for me we went back upstairs at 5:40pm for more pelvic release and rest. I had increase pelvic pressure and began moaning louder and started swearing. LeAnn suggested since things seemed to be increasing and becoming more intense that we should probably get back downstairs before things got too intense and I wasn’t able to make it downstairs. As relaxed as I was I reluctantly went downstairs at 5:50pm and in the process nearly pulled my husband’s shorts down in the hallway during a contraction. Whoops!! Since I was so relaxed laying on my side upstairs I wanted to lay on the couch. At 5:59pm my water broke during a pretty intense contraction, LeAnn of course looked it over as there was meconium present and advised us since it was moderate we would not be able to deliver in the birth tub. She also advised us that if we felt more comfortable going to the hospital since there was meconium present than we could do that as well. But I knew there was no way we would make a 40 minute drive all the way to Rochester without having that baby in the vehicle. Not just that but who the heck wants to get up and walk outside to a vehicle on a hot summer day while having intense contractions? I most certainly did not. And I trusted that my midwife knew how to handle a situation with meconium, so that was never something I worried about. Every contraction after my water broke was so intense, all I could think was “there is no way I’m going to make it several more hours with these contractions”. Especially since I was still 5cm dilated. As I’m lying on the couch I felt more and more sick. Before I knew it at 6:13pm I yelled “I need a puke bucket”. And BAM!! I filled that thing like there was no tomorrow. It’s funny, because my other 3 births were all hospital births and I after my first was born I knew what to expect. I have never had any issues with pushing. The longest I’ve ever had to push for any of my kids was 10 minutes and that was my first born. The others have all been quick………even this one. Just two minutes after transferring to the floor, the baby’s head was out at 6:35pm, LeAnn focused on suctioning her mouth and nose out. Even though baby Indira put up a fight and kept turning her head from one side to the other, LeAnn was still able to successfully get things cleaned out. Little stinker!! Once it was time to deliver the rest of her out, I remember thinking. “WHY ISN’T THIS GOING QUICKER! !” “GET HER OUT OF ME”…..yeah turns out her chest was bigger than her head, so instead of the rest of her body sliding right out with a small push, I had to work to get her out. Ok, so maybe it just felt like I had to work harder because Little Miss was born at 6:38pm. So time wise it didn’t take much time, but boy did it feel like it. She was perfect. Head full of dark black hair and so alert, looking at everyone who filled the room. 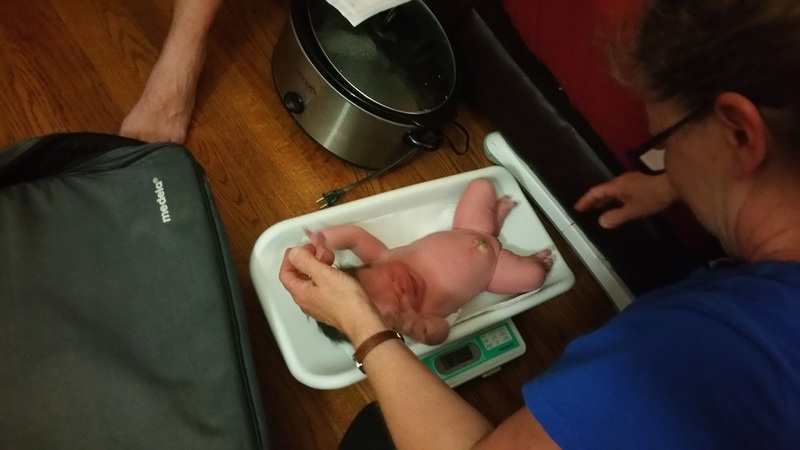 She weighed 8lbs 13oz and was 21.5 inches long. We allowed the cord to finish pulsing and our 12 year old daughter was able to cut her sisters cord. Makayla did wonderfully during the labor and birth. She was so mature and helpful and I’m so thankful she got to experience this. 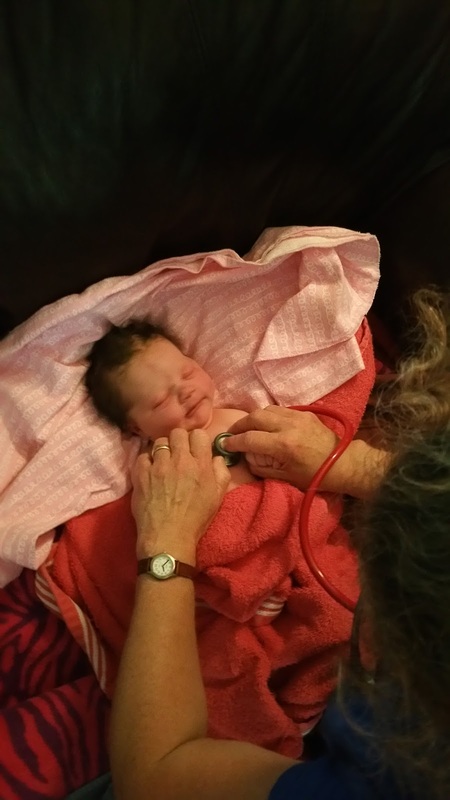 My husband and I would like to Thank LeAnn van den Bosch of WomanCare for being an amazing and supportive midwife. 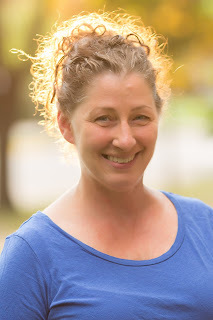 Our Birth Doula Michele Ree, I’m so happy that we FINALLY got to hire you as our doula. Rebecca Smith for being a great Midwives Assistant and Haley O’Neill for attending the birth and helping in every way possible. This was by far the best experience ever and I am very sad that it’s over and wish we could experience it again.